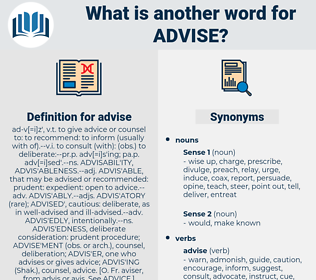 What is another word for advise? Attorneys, Lawyers, hints, advice, advisor, advisors, notify. Suggestions, guidances, admonishments, notifications, warnings, notices, minds, Assemblies, announcements, views, insights, thoughts, pointers, circles, picks, Attorneys, hints, advices, advice, advisors. warn, suggest, tell, advice, provide, communicating, urge, advisor, notify, prevail, disseminate, give, encourage, report. informs, lay, indicates, warn, propose, dissuade, persuade, suggest, tell, announce, advice, enlighten, provide, Recommendations, guide, Forewarn, urge, sensitize, advisor, acquaint, Avise, transmit, designate, notify, prevail, convey, invite, disseminate, give, discuss, steer, emphasise, encourage, report, familiarise, clarify. disapprove, fool, betray, deceive, keep quiet, dissuade, keep mum, trick, neglect, lie, stop, delude, keep secret, pretend, discourage. Whatever others may advise, this thinketh me well done.
" You cannot get there to - night," said he, " and I advise you not to try." adobe house, adipose, advisee, autopsy, autofocus, adiposis, advice, autobus, at peace, advocacy, adps, autotypic. discourage, press, consult, urge on, urge, exhort, misadvise, contraindicate, misguide, warn, admonish, tip, dissuade, propound, deter, monish, tip off. hash out, discuss, talk over.